At the Governor’s direction, the Florida Department of Economic Opportunity (DEO) today sent letters to local housing authority officials and community leaders to identify local and federal resources so there is better coordination in the joint local, state and federal response to housing needs for Puerto Rican families in Florida. See one of the letters HERE. Governor Scott said, “Today, I was proud to attend a town hall with Puerto Rico Governor Ricardo Rosselló and announce a $1 million investment for 12 of Florida’s local workforce development boards to continue to assist families displaced by Hurricane Maria seeking employment. To date, the CareerSource Florida network helped more than 7,600 Puerto Ricans find jobs in Florida and this investment will connect even more individuals with great jobs. I was also proud to announce today that following my request, FEMA has agreed to provide case management services to Puerto Rican families in Florida. These services will assist families on an individual basis with planning for their recovery needs. The funds, allocated by CareerSource Florida and distributed by the Florida Department of Economic Opportunity, are designated for employment services to assist evacuees in the five counties served by CareerSource Central Florida: Orange, Osceola, Lake, Sumter and Seminole counties. CareerSource North Central Florida, CareerSource Citrus Levy Marion, CareerSource Flagler Volusia, CareerSource Brevard, CareerSource Tampa Bay, CareerSource Pinellas, CareerSource Research Coast, CareerSource Palm Beach County, CareerSource Broward, CareerSource South Florida and CareerSource Southwest Florida also received funds to provide career assistance to evacuees. More than 7,600 individuals displaced by Hurricane Maria have sought services through the CareerSource Florida network’s local career centers thus far, primarily in the Orlando area, Miami and Fort Lauderdale. 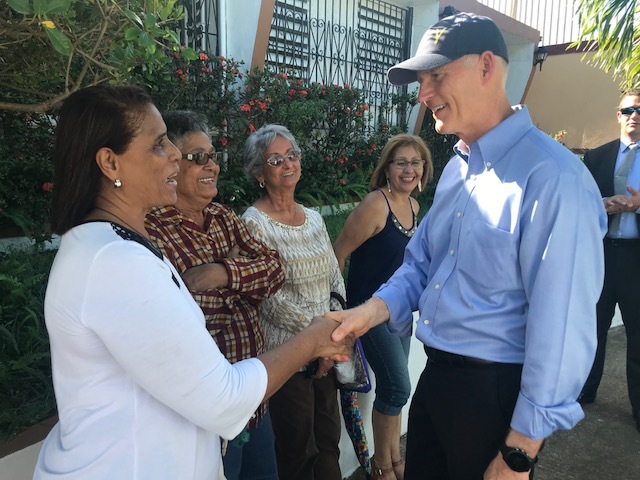 Governor Scott’s announcement follows two recent roundtables to discuss Puerto Rico relief efforts held in Doral and Orlando. CareerSource Central Florida and CareerSource South Florida are providing employment services at Multi-Agency Resource Centers in the Orlando area and Miami International Airport to Puerto Rican families displaced by Hurricane Maria. Several local workforce development boards have held recruiting fairs and workshops to assist Floridians and others impacted by Irma and Maria. For additional information about employment opportunities, please visit employflorida.com, available in English and Spanish. "When you need to attract and hire specialized talent, contact your local #CareerSourceFL board, which can host and… http://dH91ERqyAs"
"We're looking forward to joining our friends at @CareerSourceSFL for @eMergeAmericas in two weeks!… http://9wRY39iJlh"
"Our Pres. @MDennardCEO: thanks @CareerSourceCLM &amp; CEO Rusty Skinner for timely conversation today at 2019… http://2NIoSF7Jea"
CareerSource Florida is an equal opportunity employer/program. Auxiliary aids and services are available upon request to individuals with disabilities. All voice telephone numbers on this website may be reached by persons using TTY/TDD equipment via the Florida Relay Service at 711. You have successfully signed up for emails! Due to the high level of interest in the nationally recognized Quick Response Training grant program, funding for the existing fiscal year has been fully obligated. If your business has plans to hire and train new employees after July 1, 2017, click the “Continue with application” button below to start the process to realizing a highly skilled and productive workforce.